You'll be £3.99 closer to your next £10.00 credit when you purchase A History of Women in Medicine. What's this? 'Witch' is a powerful word with humble origins. Once used to describe an ancient British tribe known for its unique class of female physicians and priestesses, it grew into something grotesque, diabolical and dangerous. 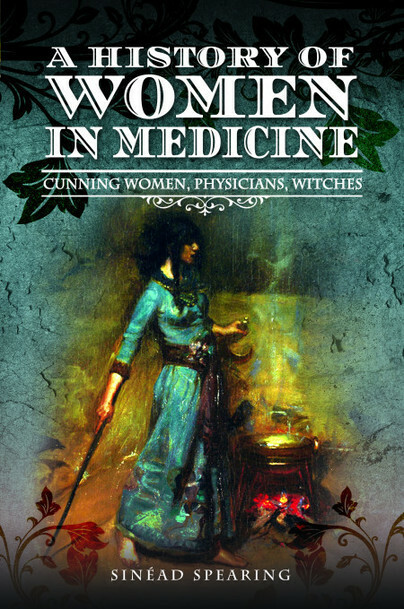 A History of Women in Medicine: From Physicians to Witches? reveals the untold story of forgotten female physicians, their lives, practices and subsequent demonisation as witches. Originally held in high esteem in their communities, these women used herbs and ancient psychological processes to relieve the suffering of their patients. Often travelling long distances, moving from village to village, their medical and spiritual knowledge blended the boundaries between physician and priest. These ancient healers were the antithesis of the witch figure of today; instead they were knowledgeable therapists commanding respect, gratitude and high social status. In this pioneering work, Sinéad Spearing draws on current archeological evidence, literature, folklore, case studies and original religious documentation to bring to life these forgotten healers. By doing so she exposes the elaborate conspiracy conceived by the Church to corrupt them in the eyes of the world. Turning these women from benevolent therapists into the embodiment of evil required a fabricated theology to ensure those who collected medicinal herbs or practiced healing, would be viewed by society as dealing with the devil. From this diabolical association, female healers could then be labeled witches and be justly tortured and tried in the ensuing hysteria known today as the European witch craze. This is a vast subject and Spearing's book is an excellent introduction to it. It should have widespread appeal, bringing these forgotten voices to the fore again. An altogether impressive and sustained work of seminal scholarship, "A History of Women in Medicine: Cunning Women, Physicians, Witches" is an extraordinary and exceptionally informative study that will be a welcome addition to any and all community, college, and university library Women's History collections, and a 'must' for the personal reading lists of non-specialist general readers with an interest in the subject. It is a remarkable read, I found it to be very hard-hitting and yet sensitive to those women it tells the stories of, it is a book that should be read by everyone, not just women who like me are interested in women’s history and celebrating how wonderful these women were but by all. I can guarantee there will be something within these pages that will intrigue everyone.... I thoroughly enjoyed reading this, it is a fresh and original book that looks into a different aspect of history. This book uses archeological, historical and case study evidence to shine a light on the wise women of centuries past and how they went from highly respected members of society, to being tortured and degraded as spawns of Satan and sources of evil. It explains the origins of the modern word, witch and talks about the Anglo-Saxon tribe which essentially founded what we would call British witchcraft and healing. Spearing looks at a wise variety of sources to back up and support her research which is both intriguing and interesting. She uses a lot of translations from old English medicinal remedy texts which is a wonderful addition to the text and looks at the remains and graves of several suspected wise women throughout England and in particular one women found buried at the Cotswolds, a women she dubs Mildbryb (Mildred).